Anyone who keep cats at home is quick to recognize that there’s a significant amount of work required of pet owners. From feeding to cleaning and entertaining between, it’s important to have the essentials covered when it comes to feline care. That doesn’t mean that these important parts of pet ownership can’t come with a little style. Feeding feline friends never looked as good as it does when a simple plastic bottle is transformed into a charming and colorful cat feeder. 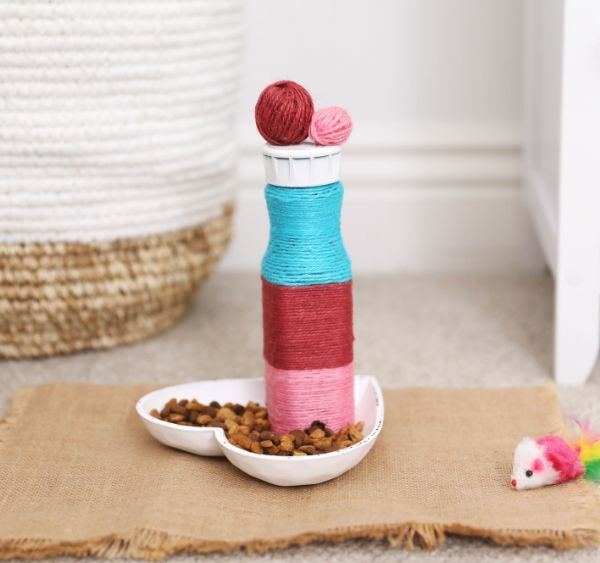 A few well-placed access points and customized yarn wrapping quickly turn a plastic bottle into a useful and personalized cat accessory in the home. Add a little elegance to the essential feeding habits of cats by repurposing an everyday beverage product. -Plastic bottle with lid, 12 oz. 1. Place a 12 oz. plastic bottle on its side on a flat surface and remove the lid. 2. Cut a triangle 1-inch in height starting at the bottom of one side of the bottle using an X-Acto knife. Cut an identical triangle into two other sides of the bottle, leaving one side unaltered. 3. Place a small spot of Gorilla super glue toward the base of the bottle and attach the end of a piece of pink yarn. 4. Line the triangles and base of the bottle with Gorilla super glue and continue wrapping the pink yarn around the bottle until 1/3 of the bottle is entirely covered. Attach the opposite end of the yarn with super glue and cut excess yarn away with thread cutters. The three triangle openings will be entirely covered with yarn. 5. Wrap red yarn around the middle 1/3 section of the plastic bottle using Gorilla super glue to attach directly above the pink yarn and at the endpoint. 6. Wrap blue yarn around the top 1/3 of the plastic bottle using Gorilla super glue to attach directly above the red yarn and just below the lid grooves. 7. 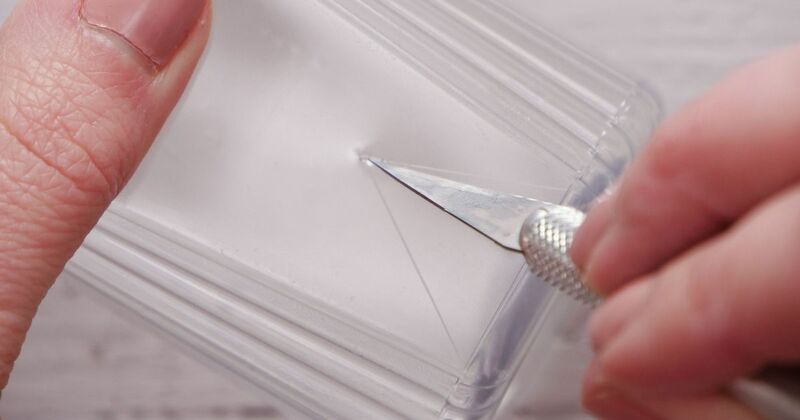 Cut the pink thread entirely away from the three triangle openings following the plastic edges using thread cutters. Begin cutting just above the first two strings of pink yarn so that the base yarn remains intact below the triangle. 8. Paint the bottle lid white and allow to dry completely. 9. Attach a small ball of red yarn and a small ball of pink yarn to the top of the lid using Gorilla super glue. 10. Place a heart-shaped white box lid upside down on a flat surface with the pointed end of the heart facing up. 11. Line the bottom of the plastic bottle with Gorilla super glue. Press firmly into the top pointed corner of the heart-shaped box lid to attach. 12. Fill the bottle with cat food and twist the lid on securely for a finished decorative cat feeder.